MONK ATHANASIAS OF ATHOS (+ 1000). MONK SERGEI, HEGUMEN OF RADONEZH (UNCOVERING OF RELICS, 1422). The Monk Athanasias of Athos, in holy Baptism named Abraham, was born in the city of Trapezund. He was early left orphaned, and being raised by a certain good and pious nun, he copied his adoptive mother in the habits of monastic life, in fasting and in prayer. Doing his lessons came easily and he soon outpaced his peers in study. After the death of his adoptive mother, Abraham was taken to Constantinople, to the court of the then Byzantine emperor Romanos the Elder, and was enrolled as a student under the reknown rhetorician Athanasias. In a short while the student attained the mastery of skill of his teacher and he himself became an instructor of youths. Reckoning as the true life that of fasting and vigilance, Abraham led a life strict and abstinent, he slept little and then only sitting upon a stool, and barley bread and water were his nourishment. When his teacher Athanasias through human weakness became jealous of his student, blessed Abraham quit his teaching and went away. During these days there had arrived at Constantinople the Monk Michael Maleinos (Comm. 12 July), hegumen of the Kimineia monastery. Abraham told the hegumen about his life, and revealed to him his secret desire to become a monk. The holy elder, discerning in Abraham a chosen vessel of the Holy Spirit, became fond of him and taught him much in questions of salvation. One time during their spiritual talks Saint Michael was visited by his nephew, Nicephoros Phokas, a reknown military officer and future emperor. The lofty spirit and profound mind of Abraham impressed Nicephoros, and all his life he regarded the saint with reverent respect and with love. Abraham was consumed by his zeal for the monastic life. Having forsaken everything, he went to the Kimineia monastery and, falling down at the feet of the holy hegumen, he besought to be received into the monastic form. The hegumen fulfilled his request with joy and gave him monastic vows with the name Athanasias. With long fasts, vigils, bending of the knees, with works night and day Athanasias soon attained such perfection, that the holy hegumen blessed him for the exploit of silence in a solitary place not far from the monastery. Later on, having left Kimineia, he made the rounds of many a desolate and solitary place, and guided by God, he came to a place called Melanos, at the very extremity of Athos, settling far off from the other monastic dwellings. Here the monk made himself a cell and began to asceticise in works and in prayer, proceeding from exploit to exploit towards higher monastic attainment. The enemy of mankind tried to arouse in Saint Athanasias hatred for the place chosen by him, and assaulted him with constant suggestions in thought. The ascetic decided to suffer it out for a year, and then wherever the Lord should direct him, he would go. On the last day of this year's length of time, when Saint Athanasias set about to prayer, an Heavenly Light suddenly shone upon him, filling him with an indescribable joy, all the thoughts dissipated, and from his eyes welled up graced tears. From that moment Saint Athanasias received the gift of tenderness ("umilenie"), and the place of his solitude he became as strongly fond of as before he had loathed it. During this time Nicephoros Phokas, having had enough of military exploits, remembered his vow to become a monk and from his means he besought the Monk Athanasias to build a monastery, i.e. to build cells for him and the brethren, and a church where the brethren could commune the Divine Mysteries of Christ on Sundays. Tending to shun cares and worries, Blessed Athanasias at first would not agree to accept the hateful gold, but seeing the fervent desire and good intent of Nicephoros, and discerning in this the will of God, he set about the building of the monastery. He erected a large church in honour of the holy Prophet and Forerunner of Christ John the Baptist, and another church at the foot of an hill, in the name of the MostHoly Virgin Mother of God. Around the church were the cells, and a wondrous monastery arose on the Holy Mount. In it were arrayed a refectory, an hospice for the sick and for taking in wanderers, and other necessary structures. Brethren flocked to the monastery from everywhere, not only from Greece, but also from other lands -- simple people and illustrious dignitaries, wilderness-dwellers having asceticised long years in the wilderness, hegumens from many a monastery and hierarchs wanting to become simple monks in the Athos Laura of Saint Athanasias. The saint established at the monastery a life-in-common ("coenobitic") monastic-rule on the model of the old Palestinian monasteries. Divine-services were made with all strictness, and no one made bold to chatter during the time of service, nor to come late or leave without need from the church. The Heavenly Patroness of Athos, the All-Pure Mother of God Herself, was graciously disposed towards the saint. Many a time he was granted to behold Her wondrous eyes. By the sufferance of God there once occurred such an hunger, that the monks one after the other quit the Laura. The saint remained all alone and in a moment of weakness he also considered leaving. Suddenly he beheld a Woman beneathe an aethereal veil, coming to meet him. "Who art thou and whither goest?" -- She asked quietly. Saint Athanasias from an innate deference halted. "I am a monk from here", -- answered Saint Athanasias and told about himself and his worries. "And on account of a morsel of dry bread thou would forsake the monastery, which was intended for glory from generation unto generation? Where is thy faith? Turn round, and I shalt help thee". "Who art Thou? ", -- asked Athanasias. "I am the Mother of thy Lord", -- She answered and bid Athanasias to strike his staff upon a stone, such that from the fissure there shot forth a spring of water, which exists even now, in remembrance of this miraculous visitation. The brethren grew in number, and the construction work at the Laura continued. The Monk Athanasias, foreseeing the time of his departure to the Lord, prophesied about his impending end and besought the brethren not to be troubled over what he foresaw. "For Wisdom disposeth otherwise than people do judge". The brethren were perplexed and pondered over the words of the saint. Having bestown on the brethren his final guidance and comforted all, Saint Athanasias entered his cell, put on his mantle and holy kukol'-headpiece, which he wore only on great feasts, and after prolonged prayer he emerged. Alert and joyful, the holy hegumen went up with six of the brethren to the top of the church to look over the construction. Suddenly, through the imperceptible will of God, the top of the church collapsed. Five of the brethren immediately gave up their spirit to God. The Monk Athanasias and the architect Daniel, thrown upon the stones, remained alive. All heard, as the monk called out to the Lord: "Glory to Thee, O God! Lord, Jesus Christ, help me!" The brethren with great weeping began to dig out their father from amidst the rubble, but they found him already dead. The Uncovering of the Venerable Relics of the Monk Sergei of Radonezh: The relics of the Monk Sergei (+ 1392, Comm. 25 September) were uncovered on 5 July 1422 during a time when the Monk Nikon (+ 1426, Comm. 17 November) was hegumen. In the year 1408, when Moscow and its surroundings suffered invasion by the Tatar horde of Edigei, the Trinity monastery was devastated and burnt, and the monks headed by the hegumen Nikon hid themselves in the forests, saving the icons, sacred vessels, books and other holy things connected with the memory of the Monk Sergei. In a vision by night on the eve of the Tatar incursion the Monk Sergei informed his disciple and successor about the coming tribulations and foretold in consolation, that the vexation would not be prolonged but rather that the monastery, arising from the ashes, would flourish and grow even more. Metropolitan Philaret wrote about this in the "Life of the Monk Sergei": "In semblance to this, that it suited Christ to suffer, and through the cross and death to enter into the glory of the Resurrection, so also doth it become everyone, that wouldst be blest by Christ in the length of days in glory, to be tested by one's own cross and death". Going through its own fiery cleansing, the monastery of the Life-Originating Trinity was resurrected in the length of days, and the Monk Sergei himself rose up, so that forevermore his holy relics should dwell within it. Before the beginning of construction of the new temple in the Name of the Life-Originating Trinity upon the spot of the former wooden one (which was consecrated on 25 September 1412), the Monk Sergei appeared to a certain pious layman and bid him inform the hegumen and the brethren: "Why do ye leave me such a while in the grave, covered over by ground and in the water, constraining my body?" And herewith during the construction of the cathedral, when they dug the ditches for the foundations, the undecayed relics of the Monk Sergei were uncovered and brought up, and all were astonished, that not only the body, but also the clothing upon him was undecayed, although round about the grave there actually stood water. Amidst a large throng of the devout and the clergy, in the presence of the son of Dimitrii Donskoi -- the prince of Zvenigorod Yurii Dimitrievich (+ 1425), the holy relics were brought up from the ground and placed temporarily in the wooden Trinity church (at this spot is located now the church of the Descent of the Holy Spirit). With the consecration in 1426 of the stone Trinity cathedral the relics were transferred into it, where at present they remain. All the threads of the spiritual life of the Russian Church converge towards the great Radonezh saint and wonderworker, and through all of Orthodox Rus' the graced life-creating currents extend outwards from the Trinity monastery founded by him. Naming a church for the Holy Trinity within the Russian land began with holy Equal-to-the-Apostles Ol'ga (+ 969, the account about her is under 11 July), who erected the first Trinity temple at Pskov. Afterwards there were erected similar churches in Great Novgorod and other cities. The spiritual contribution of the Monk Sergei in the teaching of theology about the Holy Trinity is quite significant. The monk had profound insight into the secret mysteries of theology with the "mental eyes" of the ascetic -- in prayerful ascent to the Tri-Hypostatic (i.e. in Three-Persons) God, and in the spiritual experience of communion with God and God-likeness. "Co-heirs of the perfect light and contemplation of the MostHoly and All-Sovereign Trinity, -- explained Saint Gregory the Theologian, -- are those which become perfectly co-united in the perfection of the Spirit". The Monk Sergei knew experientially the mystery of the Life-Originating Trinity, since in his life he became co-united with God, he became a communicant to the very life of the Divine Trinity, i.e. he attained as much as is possible on earth to the measure of "theosis" ("divinisation", "obozhenie"), becoming a "partaker of the Divine nature" (2 Pet. 1: 4). "Whoso loveth Me, -- saith the Lord, -- that one wilt keep to My word; and My Father wilt love him, and We shalt come unto him and make abode with him" (Jn. 14: 23). Abba Sergei, in everything observing the commands of Christ, belongs to the rank of holy saints in the souls of whom the Holy Trinity "hath made abode"; he fashioned himself into "an abode of the Holy Trinity", and everyone with whom the Monk Sergei associated, he elevated and brought into communion unto the Holy Trinity. The Radonezh ascetic, with his disciples and conversants, enriched the Russian and the OEcumenical Church with a new knowledge and vision of the Life-Originating Trinity, the Beginning and Source of life, manifesting Itself unto the world and to mankind in the "Sobornost'" ("Communality") of the Church, with brotherly unity and the sacrificial redemptive love of its pastors and children. In the spiritually symbolic gathering together of Rus' in unity and love, the historical effort of the nation became a temple of the Life-Originating Trinity, erected by the Monk Sergei, "so that by constant attention to It would be conquered the fright of the hateful discord of this world". The worship of the Holy Trinity, in forms created and bequeathed by the holy Hegumen of Radonezh Sergei, became one of the most profound and original of features of Russian ecclesiality. With the Monk Sergei, in the Life-Originating Trinity there was posited not only the holy perfection of life eternal, but also an image-model for human life, a spiritual ideal towards which mankind ought to strive, since that in the Trinity as "Indivisible" ("Nerazdel'nyi", Grk. "Adiairetos") discord is condemned and "Sobornost'" ("Communality") is blest, and in the Trinity as "Inseparable" ("Neslyannyi", "Akhoristos", -- per Fourth OEcumenical Council at Chalcedon in year 451) coercion is condemned and freedom blest. In the teaching of the Monk Sergei about the MostHoly Trinity the Russian nation sensed profoundly its own catholic and ecumenical vocation, and comprehending the universal significance of the feastday, the people embellished it with all the variety and richness of the ancient national custom and people's verse. All the spiritual experience and spiritual striving of the Russian Church was embodied in the liturgical creativity of the feast of the Holy Trinity, of trinitarian church rituals, icons of the Holy Trinity, and churches and monasteries of this nomen. The theological insight of the Monk Sergei in transformation was rendered as the wonderworking icon of the Life-Originating Trinity written by the Monk Andrei (Andrew) of Radonezh, surnamed Rublev (+ 1430, Comm. 4 July), a monk-iconographer, monasticised in the Trinity-Sergiev monastery, and written at the blessing of the Monk Nikon in praised memory to holy Abba Sergei. (At the Stoglav Council of 1551 this icon was affirmed as proper model for all successive church iconographic depiction of the MostHoly Trinity). "The hateful discord", quarrels and commotions of worldly life were surmounted by the monastic life-in-common, planted by the Monk Sergei throughout all Rus'. People would not have divisions, quarrels and war, if human nature, created by the Trinity in the image of the Divine Tri-Unity, were not distorted and impaired by Originial sin. Overcoming by his own co-crucifixion with the Saviour the sin of particularity and separation, repudiating the "my own" and the "myself", and in accord with the teachings of Saint Basil the Great, the life-in-common monks restore the First-created unity and sanctity of human nature. The monastery of the monk Sergei became for the Russian Church the model for suchlike renewal and rebirth, in it were formed holy monks, bearing forth thereof features of the true path of Christ to remote regions. In all their works and actions the Monk Sergei and his disciples churchified life, giving the people a living example of its possibility. Not for renouncing the earth, but rather for transfiguring it, they proclaimed ascent and they themselves ascended unto the Heavenly. The school of the Monk Sergei, through the monasteries founded by him, his disciples and the disciples of his disciples, embraces all the vastness of the Russian land and threads its way through all the remotest history of the Russian Church. One fourth a portion of all Russian monasteries, the strongholds of faith, piety and enlightenment, was founded by Abba Sergei or his disciples. The "Hegumen of the Russian land" was what people called the founder of the Domicile of the Life-Originating Trinity. The Monks Nikon and Mikhei of Radonezh, Syl'vester of Obnorsk, Stefan of Makhrisch and Avraam of Chukhlomsk, Athanasii of Serpukhov and Nikita of Borovsk, Theodore of Simonovsk and Pherapont of Mozhaisk, Andronik of Moscow and Savva of Storozhevsk, Dimitrii of Prilutsk and Kirill of Belozersk -- they were all disciples and conversants of "the wondrous elder", Sergei. Sainted-hierarchs Alexei and Kiprian -- Metropolitans of Moscow, Dionysii ArchBishop of Suzdal', and Stephen Bishop of Perm, were associated with him in spiritual closeness. The Patriarchs of Constantinople Kallistos and Philotheos dispatched missives to him and sent their blessings. Through the Monks Nikita and Paphnutii of Borovsk threads a spiritual legacy to the Monk Joseph of Volotsk and others of his disciples, and through Kirill of Belozersk -- to Nil Sorsky, to German, Savvatii and Zosima of Solovetsk. The Church venerates also disciples and co-ascetics of the Monk Sergei, whose memories are not specifically noted within the "Mesyatseslov" lists of saints under their separate day. We remember, that the first to arrive for the Monk Sergei at Makovets was the elder Vasilii the Gaunt ("Sukhoi"), called such because of his incomparable fasting. Second was the Monk Yakuta, i.e. Yakov (James), of simple peasant stock, who without a murmur spent long years at the monastery on errands of drudgery and difficult obedience. Among his other disciples, there came to the Monk Sergei his fellow countrymen from Radonezh the Deacon Onisim and son Elisei. When 12 monks had gathered and the constructed cells were fenced in by an high enclosure, the abba appointed Deacon Onisim the gate-keeper, since his cell was outermost from the entrance to the monastery. Under the protective shadow of the Holy Trinity monastery the Hegumen Mitrophan spent his final years, -- he it was who formerly had vowed the Monk Sergei into the angelic form and guided him in monastic efforts. The grave of dead and soon blest Starets Mitrophan became the first in the monastery cemetery. In the year 1357 there arrived at the monastery from Smolensk the Archimandrite Simon, who resigned his venerable position as head of one of the Smolensk monasteries, to become a simple obedient of the God-bearing Radonezh hegumen. In recompense for his great humility, the Lord granted him to share in the miraculous vision of the Monk Sergei about the future increase of his monastic flock. With the blessing of the abba, the Blessed elder Isaakii the Silent took upon himself the deed of prayerful silence; his silence was more instructive than any words for the monks and those outside. Only one time after a year of silence did the Monk Isaakii open his mouth -- to testify, how he had seen an Angel of God serve together at the altar of the Monk Sergei, in making the Divine Liturgy. An eyewitness of the grace of the Holy Spirit, co-effectualised for the Monk Sergei, was also the ecclesiarch Simon, who once saw, how an heavenly fire came down upon the Holy Mysteries and that the saint of God "did commune the fire unburningly". The Elder Epiphanii (+ 1420) was somewhat later, during the time of hegumen Nikon, a priest of the Sergiev flock. The Church names him Epiphanii the Wise for his deep learning and great spiritual talents. He is known as the compiler of the Life of the Monk Sergei and of his conversant Saint Stephen of Perm in eulogy to them; he wrote also the "Account of the Life and Repose of GreatPrince Dimitrii Donskoi". The vita of the Monk Sergei, compiled by Epiphanii 26 years after the death of the monk, i.e. in 1418, was later reworked by the Monk-hagiographer Pakhomii the Serb, called the Logothete, who had come from Athos. To the monk Sergei, as to an inexhaustible font of spiritual prayer and grace of the Lord, at all times came in veneration thousands of the people -- for edification and for prayers, for help and for healing. And each of those having recourse with faith to his wonderworking relics he heals and renews, fills with power and with faith, transforms and guides upwards with his light-bearing spirituality. But it was not only spiritual gifts and graced healings bestown to all, approaching with faith the relics of the Monk Sergei; to him likewise was given by God the grace to defend against enemies of the Russian land. The monk by his prayers was with the army of Dimitrii Donskoi at the Battle of Kulikovo Pole ("Field"), -- he even blessed to go to the military effort his own monks, Aleksandr Peresvet and Andrei Oslyab. He directed Ivan the Terrible the place for erection of the fortress of Sviyazhsk and helped in the victory over Kazan. During the time of the Polish incursion the Monk Sergei appeared in a dream to the Nizhni Novgorod citizen Kozma Minin, ordering him to gather funds and equip an army for the liberation of Moscow and the Russian realm. And when in 1612 after a molieben to the Holy Trinity the militia of Minin and Pozharsky moved on towards Moscow, a propitious breeze fluttered the Orthodox standards, "as though from the grave of the Wonderworker Sergei himself". To the period of the Time of Troubles and the Polish incursion belongs the heroic "Trinity sitting-tight", when many a monk with the blessing of the hegumen Saint Dionysii repeated the military holy deed of the Sergiev disciples Peresvyet and Oslyab. For one and an half years -- from 23 September 1608 to 12 January 1610 -- the Polish laid siege to the monastery of the Life-Originating Trinity, hoping to plunder and destroy this sacred bulwark of Orthodoxy. But by the intercession of the MostHoly Mother of God and through the prayers of the Monk Sergei, "with much disgrace" they fled finally from the walls of the monastery, pursued by Divine wrath, and soon even their leader Lisovsky perished a cruel death on precisely the Monk Sergei's day of memory, 25 September 1617. In 1618 the son of the Polish king, Vladislav, came right up to the walls of the Holy Trinity monastery. But being powerless against the grace of the Lord guarding the monastery, he was compelled to conclude a peace-treaty with Russia at the monastery village of Deulino. After this a church was erected in the name of the Monk Sergei. 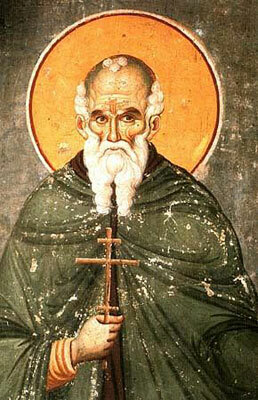 In the year 1619 the Jerusalem patriarch, Theophanes, visited the Lavra amidst his journey to Russia. He especially wanted to see those monks who in time of military danger made bold to put over their monastic garb the chain-mail coat and with weapon in hand to go up onto the walls of the holy monastery, warding off the enemy. The Monk Dionysii the hegumen (+ 1633, the account about him is under 12 May), in speaking about the defense, presented to the patriarch more than twenty monks. The first of them was Athanasii (Oscherin), very up in years and with the yellowed greyness of an elder. The patriarch asked him: "Didst thou go to war and lead soldiers?". The elder answered: "Yes, holy Vladyko, it was made necessary by bloody tears". -- "What is most proper for a monk -- prayerful solitude or military exploits before the people?" Blessed Athanasii, making poklon, answered: "Every thing and every deed has its own time. Here on my head is a Latin signature, from a weapon. There are six more memorials of lead in my body. Sitting in the cell at prayer, could I indeed have found suchlike inducements towards moaning and groaning? I did all this not at my own pleasure, but for the blessing of the service of God sent us". Touched by the wise answer of the humble monk, the patriarch blessed and hugged him. He blessed also the other soldier-monks and expressed his admiration to all the brethren of the Lavra of the Monk Sergei. The deed of the monastery, during this grievous Time of Troubles for all the nation, was recorded by the steward Avraam (Palitsyn) in "An Account about the Happenings of the Time of Troubles", and also by the steward Simon Azar'in in two hagiographic collections: "Book about the Miracles of the Monk Sergei" and the "Life of the Monk Dionysii of Radonezh". In the year 1650 Simeon Shakhovsky compiled an akathist to the Monk Sergei, as "valiant voevoda (military-leader)" of the Russian land, in memory of the deliverance of the Trinity monastery from the enemy siege. Another akathist in existence to the Monk Sergei was compiled in the XVIII Century, and its author is considered to be the Moscow metropolitan, Platon (Levshin, + 1812). In the times following, the monastery continued to be an inextinguishable torch of spiritual life and church enlightenment. From its brethren one after the other were chosen for service many famed hierarchs of the Russian Church. In the year 1744, for its service to the country and the faith, the monastery was entitled a Lavra. In 1742 within its enclosure was established the religious seminary, and in the year 1814 the Moscow Spiritual Academy was transferred there. And at present the Domicile of the Life-Originating Trinity serves as one of the primary centres of grace of the Russian Orthodox Church. Here at the promptings of the Holy Spirit are done the acts of the Local Councils of the Russian Church. At the monastery is a place of residence of His Holiness the Patriarch of Moscow and All Rus', which carries upon it the special blessing of the Monk Sergei, in the established form, "Archimandrite of the Holy Trinity Sergiev Lavra". The fifth of July, the day of the Uncovering of the relics of holy Abba Sergei, hegumen of the Russian Land -- is a crowded and solemn church feastday at the monastery. © 1998 by translator Fr. S. Janos.